Penn GSE Senior Fellow Alan Ruby delivers the first Faculty Global Seminar on the school's work in Kazakhstan. Alan Ruby stood outside the Kazakh Prime Minister’s office, waiting to deliver a briefing on an evaluation that brought him to the country a few days before. As he talked with his Kazakh counterpart, Ruby learned that official’s next assignment: launching Kazakhstan’s first research intensive English language university. Already on the faculty at Penn GSE, Ruby was intrigued. After their briefing, the two men got coffee and spent the afternoon discussing challenges and opportunities of founding a university in the former Soviet republic. That chance encounter in 2009 led to a deep and ongoing collaboration between Ruby, Penn GSE faculty, senior Kazakh officials, and educators in the country. Ruby described the work September 26, in the first Faculty Global Seminar presented by Penn GSE’s Global Engagement Office. It was the first in a series of six lectures that will be held in the 2018-2019 school year. Ruby, Senior Fellow at Penn GSE and Senior Scholar with Penn AHEAD, became the founding director of the Global Engagement Office in July 2018. His career has spanned the government, business, philanthropy, and education sectors. At Penn, his research and teaching focus on the effects of globalization on universities and education around the world. Penn GSE’s collaboration with the Kazakh officials began in earnest a few months after the initial meeting, Ruby said. 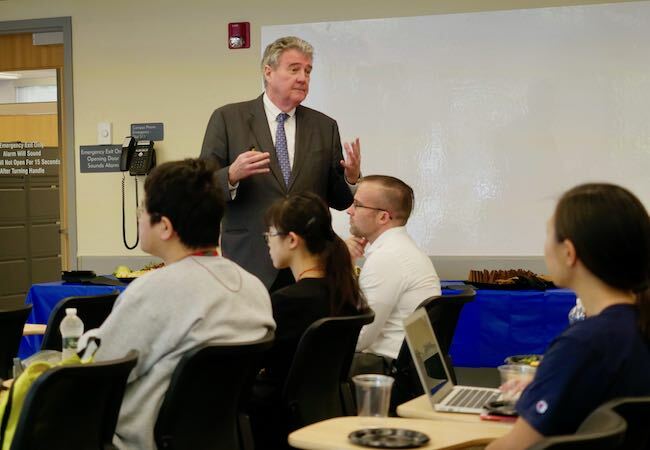 The planning team for what would become Nazarbayev University (NU) came to Philadelphia for a weeklong crash course on university administration and governance led by Penn GSE higher education faculty, with briefings from senior leaders across Penn’s campus. With the university’s scheduled opening less than a year away, the Kazakh team sought more involvement from Penn GSE’s experts. NU was to be the first research university in the country with instruction entirely in English. Its leaders explained to Ruby that the university would help transition the central Asian country closer to a knowledge-based economy that could participate in Western trade. Before formalizing the relationship, Ruby said Penn GSE set clear expectations for the work’s scope and intent. Penn GSE’s Faculty were committed to building Kazakh capacity, not creating dependence. They insisted that all their work would be transparent, and part of systematic scholarly research. And, with an eye toward the nation’s social history, it was critical that the new university operate under an autonomous, ethical model. Ruby, along with Matthew Hartley, Peter Eckel, and other Penn GSE colleagues, offered support in creating NU’s charter, its board of trustees, making the first faculty and administrative hiring decisions, and moderating governance decisions throughout the process. The university has set a new standard for Kazakh higher education, Ruby said. It has now graduated over 1,300 first degree recipients – the equivalent of an American bachelor’s degree – and over one-third of those graduates have pursued advanced study. Following their successful collaboration with NU, Ruby, Hartley, and Eckel have gone on to support dozens of other emerging Kazakh universities. Each travels from Philadelphia to Kazakhstan and back several times a year. As Ruby was quick to note, the one-way trip takes a full twenty-four hours of travel — if you are lucky. The Kazakh education ministry was also invested in creating a national network of secondary schools designed to prepare students for the new university model. Penn GSE researchers played a role in establishing the Nazarbayev Intellectual Schools (NIS). This series of 21 pilot schools are instructing 15,000 students in Kazakh, Russian, and English. Kazakh leaders hope the NIS model will one day be implemented across the country. Modernizing teacher education has been an important underpinning of the ministry’s effort. In the past, Kazakh schools used curriculum based on memorization. NIS’s teacher development programs, which have graduated more than 250,000 Kazakh teachers, are helping to introduce a curriculum based on problem-solving favored in the schools of most advanced economies. To sustain the rapidly developing national education system, a graduate school of education at NU is focusing on institutional leaders and the challenges of implementing a trilingual education system. Penn GSE has partnered with the education faculty at the University of Cambridge in the United Kingdom to help make it a reality. The outcomes of these collaborations have been both impressive and promising for Kazakh students and educators. The research activity of Penn GSE faculty partners has also led to journal articles, chapters, one book, and a second in the works. But the process hasn’t been without its challenges. Ruby was candid about the complications that can accompany cross-cultural work. Language and structural differences have on occasion led to colorful misunderstandings between the American and Kazakh teams, underscoring the need for clear, simple communication. Respecting and listening to the local community is chief among the lessons he’s taken to heart.